Rev. George Annadorai served as the Gate Keeper for the Golden Gate (1998-2008) at the All Nations Convocation in Jerusalem, led by Tom Hess. ( a ) bringing the Jews in the diaspora back home to Israel (Aliyah - Isaiah 49:22). ( b ) blessing the Holocaust Survivors (Isaiah 40:1-2 ; 61:1-3). ( c ) business opportunities for the poor (Ethiopians – Isaiah 60:1-3). 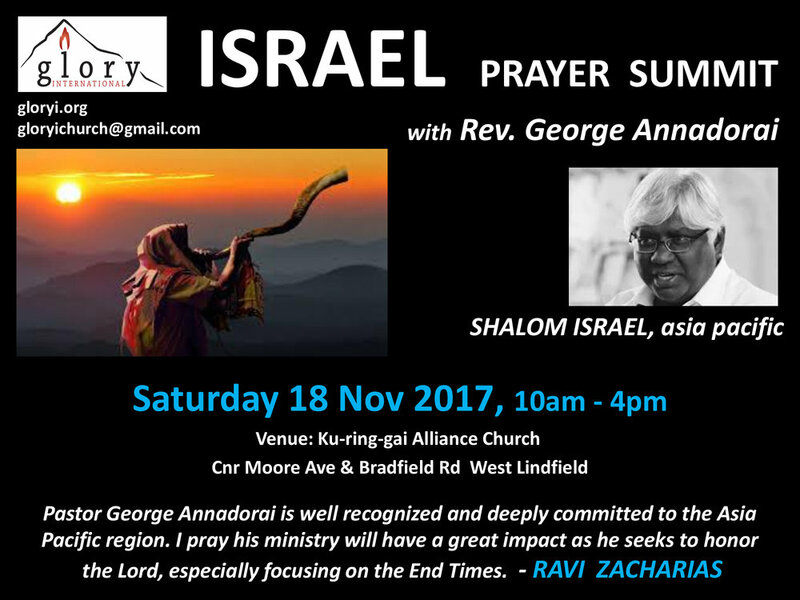 He spends 6 months a year travelling across the nations in the east, Asia and Pacific, connecting pastors and professionals in the Marketplace, and politicians with the nation of Israel based on Isaiah 62:10-12.